Farmersgirl Kitchen: Chocolate and Sausages! One of my colleagues at work has just returned from New York and gave me this candy bar. Beligan white chocolate with lemon peel and ginger. Check out Dylan's here . 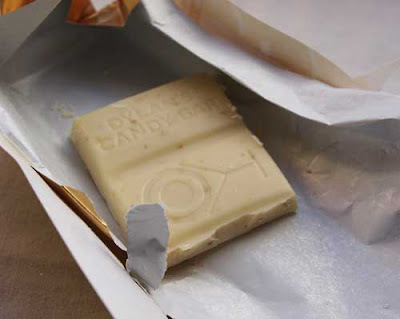 I'm usually not that keen on white chocolate as I find it too sweet, but this was delicious. It was creamy and the little crunchy bits of lemon and ginger took away from the sweetness of the chocolate. Remember I was telling you about all the eggs I had to get through? Well there are only two left in the basket now (another 6 will arrive tomorrow lol!) 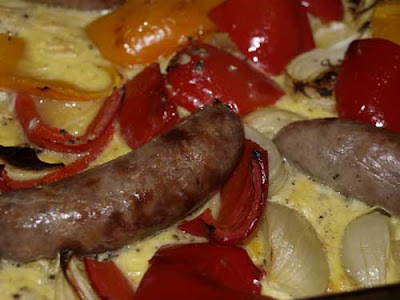 I roasted the onions and sausages in the oven in a little olive oil and then added the red and yellow peppers. Six eggs beaten with seasoning went in after the peppers had started to soften and it was a tasty supper served with a mixed salad. I had a fairly major cook-in this morning. Big pot of Carrot & Tomato soup, Chicken Korma, Pork with rosemary and mushrooms and Arabian Lamb. I'm freezing all of these away for the time when the kitchen is out of commission, another couple of weeks before that happens yet as the joiner was round last night to say he has been held up with the job he is doing at the moment. I also made a spinach and cottage cheese canneloni. Not pics as yet I'm afraid. Lemon and ginger in the chocolate sounds good. I too generally find white chocolate too sweet but Montezuma's does a nice line in white chocolate with peppercorns. I feel so lucky to have found you after you commented on my guest blog on Rebecca's "Chow and Chatter." (Girlfriend network/banana bread.) The eggs, sausage and chocolate all look gorgeous here! Can't wait to see more from you! I bet that chocolate is quite delicious with the lemon and ginger, and those sausage and eggs look incredibly tasty! The white chocolate with lemon and ginger sounds interesting. I hope to get to try one day. Oh Janice, I was half expecting to see a recipe with sausages AND chocolate in the same dish with that title, I was peering through my fingers haha. I'm so envious of your plentiful cooking day, I want to reserve a day for that soon, get some things in the freezer! P.S both the chocolate and sausages look scrummy! You have been busy - everything you have cooked for the freezer sounds delicious. I too love the sound of lemon and ginger in the chocolate. The chocolate bar sound most delicious and you egg dish looks wonderful as well. Best of luck with your new kitchen! I hope it comes together quickly! Wow, that is one major cookout in the morning! I love pork with rosemary! I love white chocolate! Looks yummy with the lemon and ginger. Very unique flavors for chocolate. that chocolate looks so good! so do the sausages.